HistoBLOG #1: Ever Wondered Why Liverpool is called Liverpool? ~~Nowadays, we tend to take place names for granted…after all we see them written down almost everywhere we look…on maps, in books and newspapers, leaflets and flyers…and of course, the internet! As such, it’s not that easy to visualise life back in the thirteenth century when there were no signs on the cart track or pathway welcoming travellers to Liverpool…when street names were non-existent and, if buildings had a particular purpose, pictorial images above a doorway would likely define them. Nevertheless, places do have names…names given to them by locals, by travellers or by conquering armies. Indeed, many place names in England today hark back to Roman times and were meticulously recorded by their scribes. Liverpool, however, probably didn’t exist as a recognisable place in Roman times and next to nothing is known of LIVERPOOL before the creation of the borough 1,000 or so years later, in 1207. Indeed, a Roman or some early Briton or Angle venturing to cross the tossing Mersey would encounter a sandy shore with outcropping rocks and gently rising ground beyond. Landing to explore, he would find a triangular plateau, some 50 feet above sea level, with a descent on the further or eastern side towards a little stream discharging into the river by the creek at the southern end of the triangle. In the course of his journey would he have seen any men? No traces of early habitation have been discovered; but, like other stream mouths called the ‘Pool’ – it was the very place to attract a colony of fishermen. The Pool must have been of importance, for it most probably gave a name to the place…indeed, few now doubt that the end of the name refers to the pool or inlet from which the first dock was formed. In the Domesday survey of 1086 Liverpool is almost certainly one of the six unnamed berewicks attached to the manor of West Derby. At some date between 1166 and 1189 it was granted by Henry II to Warine de Lancaster, along with other lands. On 23 August 1207 King John reacquired it. Five days later the so-called 'charter' was issued which turned the vill into a borough. John’s charter of 1207 gave us the name and spelling of Liuerpul. The meaning and origin of the first part of the name, Liver, has been debated regularly by wise men and women, with few, if any, of the explanations put forward meeting widespread acceptance, perhaps due to the variety of spellings used over the centuries. In the early days, dictionaries did not exist and there was no universally prescribed way to spell. And, as we learned above, in the absence of any definitive, documented reference point, writers and travellers simply apply their own interpretation of what they hear…most probably via an unfamiliar accent! Down the centuries there have been 40 different spellings of the name. Some examples include a Poll tax return of 1379 referring to William of Lyverpull – mayor. Other variations are Liuerpul (1207); Leuerepul (1229); Liuerpol (1266); Lyuerpole (1346); Leuerpoll (1393); Lytherpole (1445); Letherpole (1545); Litherpoole otherwise Liverpoole (1752). The form in th is found mainly in the 15th and 16th centuries. What is interesting is that the vast majority of variations comprise just one word, implying that the first part is clearly linked to the second and intended to describe the nature, or an attribute of the pool itself. 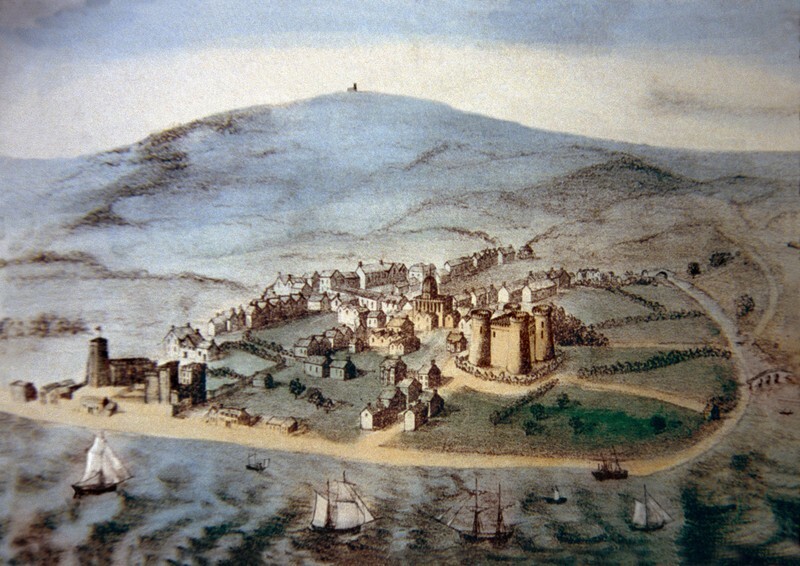 The town’s geographical location meant it was relatively easy to reach by both Welsh and Irish traders and settlers. In Irish the name is written as "Learpholl", while some writers have identified the Welsh word "Llif", meaning a flood, as a potential derivation. Similarly, "pool" in place names in England is typically derived from the late British or Welsh "Pwll" meaning a pool, an inlet or a pit. An even older Welsh name for Liverpool is "Llynlleifiad", meaning "pool of the floods". Less likely suggestions, include 'elverpool', a reference to the large number of eels in the Mersey. Do you agree? Do you have an alternative theory? Let us know by joining the debate!